Pedestrians aged 18 to 24 are most likely to be distracted by their smartphones when crossing the road. A study commissioned by Ford surveyed 10,000 people across Europe to highlight what many motorists will see as an all too common problem. According to official data, more than 85,000 pedestrians lost their lives on European roads between 2003 and 2013. And car crashes are the leading cause of death in 18 to 24-year-olds. More than half of those surveyed admitted to using their device when crossing the road, even when there is no recognised crossing. But it's the younger pedestrians that appear to be most a risk with almost 9 out of every ten 18 to 24-year-olds saying they the have been using their phone when crossing the road. And 22 per cent saying they've been involved in an accident or near miss. Ford is highlighting the dangers to distracted pedestrians as part of its Driving Skills for Life (DSFL) driver programme. Aimed at novice drivers it is now available in the UK with the training designed to highlight the risks of drink driving and using social media when driving. DSFL will take place in the UK at London's ExCeL centre from Novemebr 20 to the 22 - just ahead of National Road Safety week. "It’s one thing to walk along the pavement with headphones on listening to music, but stepping into a road while texting, playing a game or browsing online is extremely dangerous," said Jim Graham, manager, Ford DSFL. "Our training makes young people more aware of their surroundings both as a driver and a passenger, so hazards can be anticipated earlier." Ford recently introduced a new pedestrian detection system that can help avoid a collision or at least reduce the impact of one. 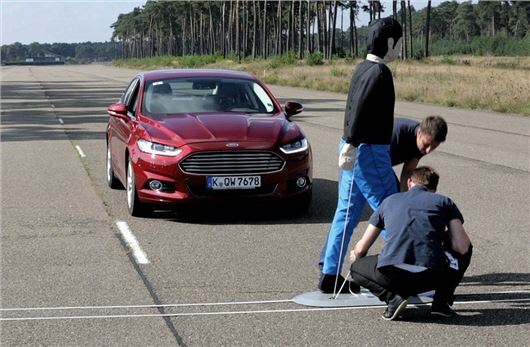 Called Pre-Collision Assist with Pedestrian Detection it's available on the new S-MAX, Mondeo and Galaxy. Research from the Institute of Advanced Motorists (IAM), shows that 23 per cent of vehicle accidents involving a pedestrian injury in the UK occur when a pedestrian fails to look properly, is careless or reckless, or is in a hurry.